Anyone who has ever experienced unrequited love or the 1980s has a special, lonely, disappointed place in his/her heart for The Smiths. The Manchester-based mope-pop band has been provoking floods of feelings for decades. Although after an acrimonious split in 1987, former frontman Steven Patrick Morrissey has often vowed that fans would never see The Smiths again, there’s now a new way to look at the band’s music. 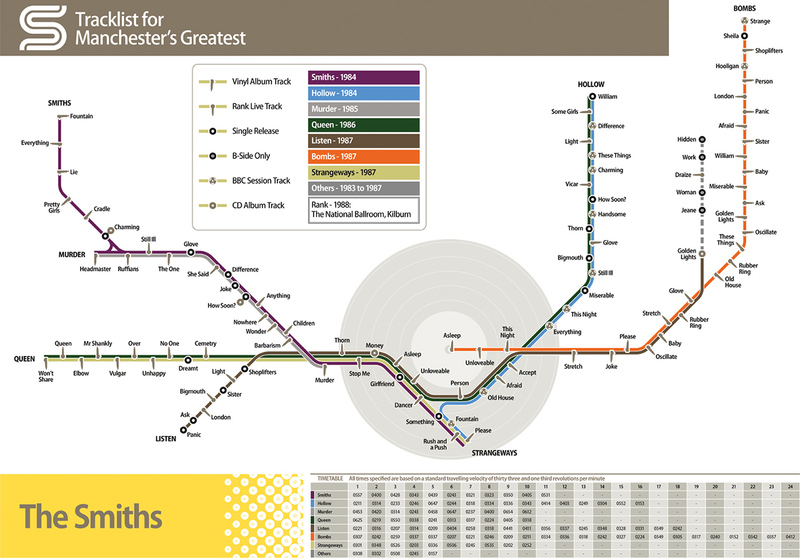 Aiden Smith of the U.K. art blog Proof Spirit has created a loving tribute to the music of The Smiths by converting it into a transit map, not unlike that of the London Underground. This visualization shows where some of the track lists of the band’s various LPs intersect. Although the Smiths only had four studio albums (albeit four major albums), they released several other collections, rarities, and a live LP. Each track on each album is depicted on the map as another train traveling through Smithstown, with the individual songs serving as stops. Now that’s a commute I wouldn’t mind getting stuck in! Tags: aiden smith, map, Morrissey, Proof Spirit, records, The Smiths, This Charming Man. Bookmark the permalink.